Free Tanah Lot, Tabanan, or monkey forest tour everyday at 11.00 a.m. The natural rejuvenating energies of the Indian Ocean surf, the gently sloping rice terraces and the invigorating sea air make this a sanctum for a complete, 'get away from it all' holiday. Restful quiet, superb food and total comfort. The ten bungalows of WakaGangga perch on gently sloping rice terraces which fringe a sparkling black sand beach on the edge of the Indian Ocean. Local stables provide horses for a mystic ride on the seemingly endless beach and the famous Tanah Lot temple, one of Bali's most sacred places, is only a few minutes away. 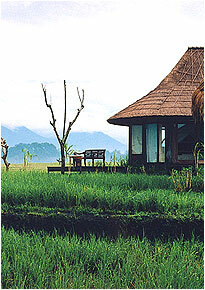 The style in the same as other the Waka Resorts. You are surrounded by the textures and colours of nature; dressed slate; tiles; smooth unpainted wood; soft homespun fabrics; intricately worked copper; fragrant alang-alang grass roofing; natural bamboo; rough cut stone; flowers and foliage.